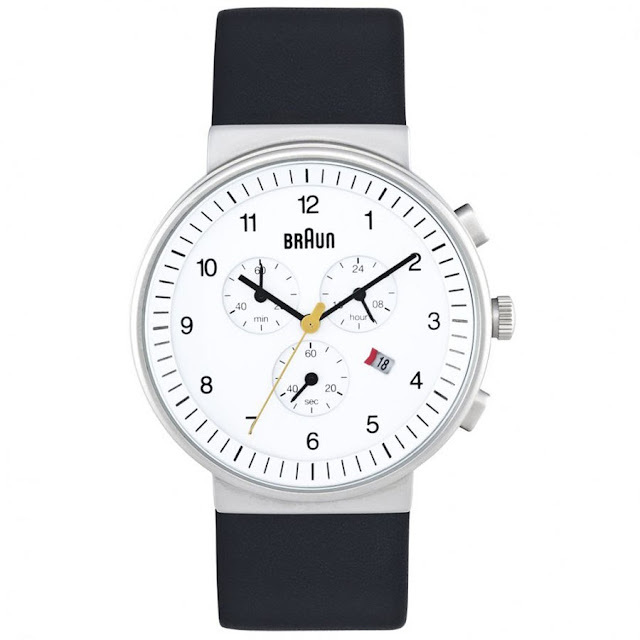 Braun Men's Chronograph Watch with White Face and Black Band. 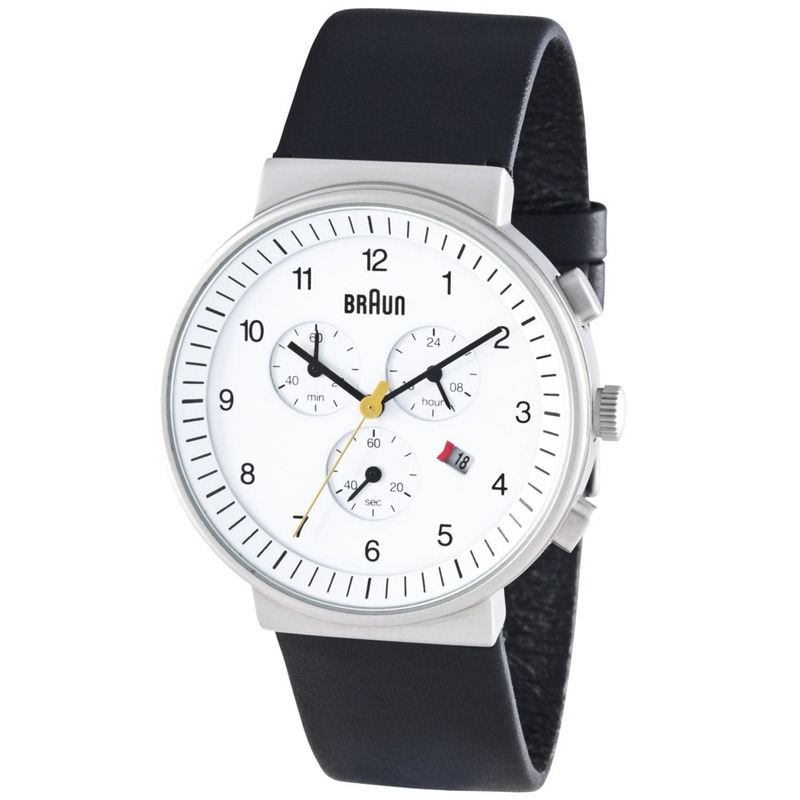 Stylish and sleek mens Braun watch in stainless steel and leather. 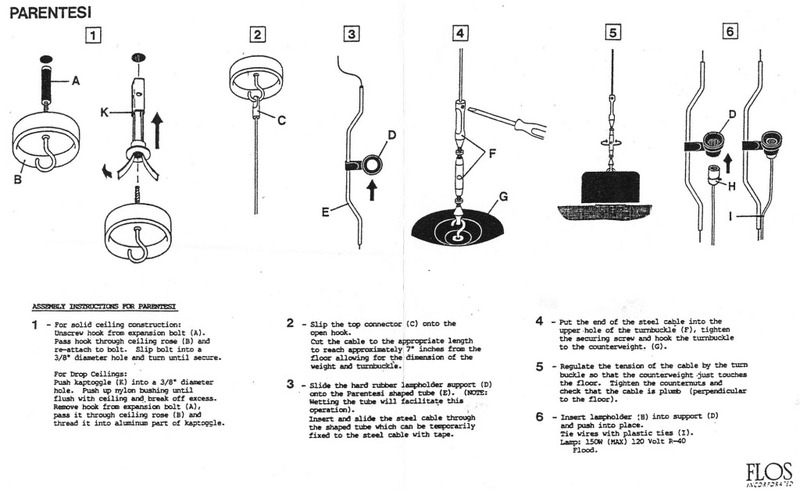 Features include date function, chronograph and numeral hour markers. 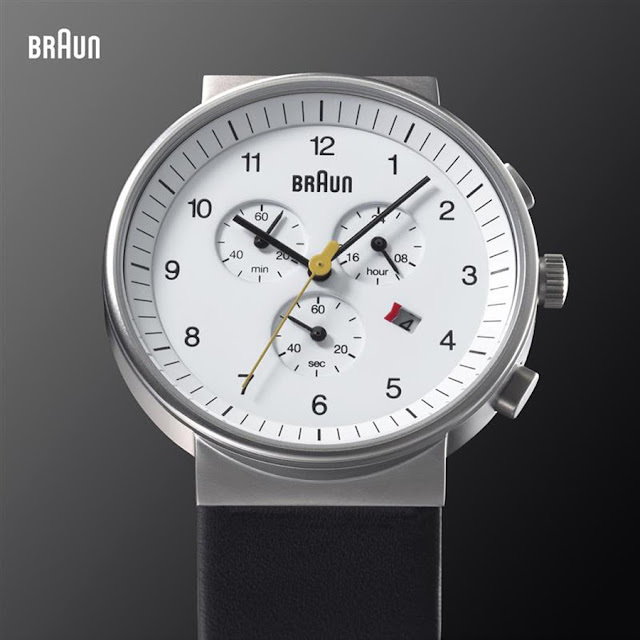 If you like classic design men's watches, you will love our new Braun Chronograph Watch! The Braun chronograph is already an award-winning design classic with its simple stylish design and perfect simplicity. 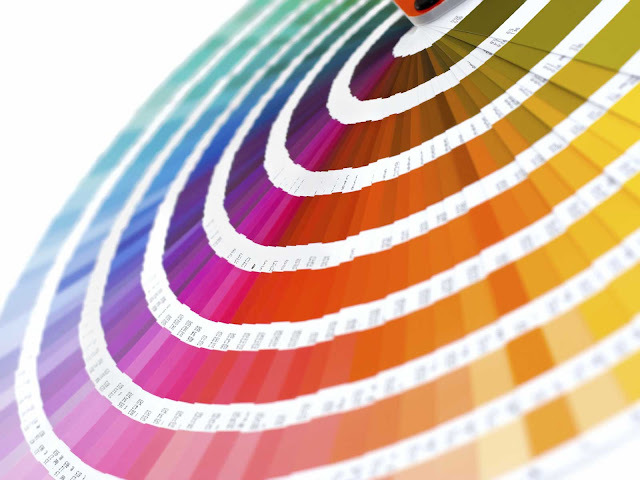 The size of the case is perfect with a 40mm scratch-resistant mineral glass face with easy-to-read markers. Its genuine black leather strap and black strap buckle with Braun logo make it really comfortable to wear. It is very light, relatively thin for a chronograph and fantastic in size. 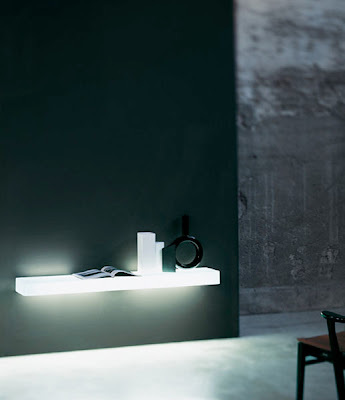 The attention to details does not spoil the simple and purified design. 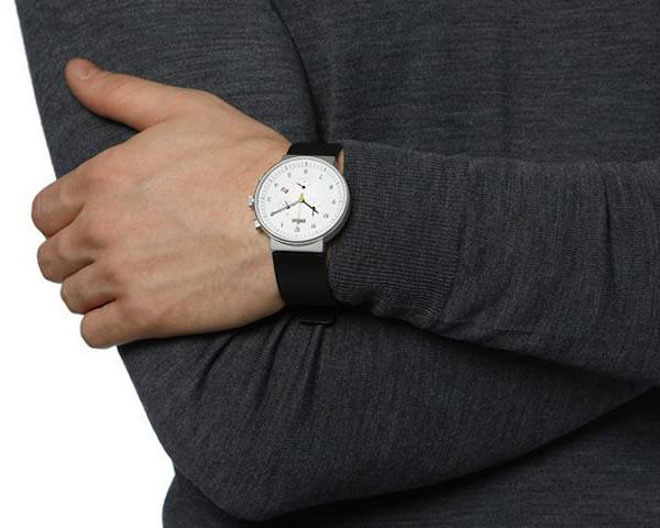 The understated elegance and cool design finishes off this beautiful watch. This beautiful Braun men's Chronograph Watch is a quintessential example of the "less, but better" philosophy of Braun design. The Braun Watch is a unique and functional gift idea for everyone you know, including yourself! The outstanding design concept of the Braun Classic Chronograph Watch received two Gold iF product design awards and two Red Dot honourable mentions from the juries of leading international design experts in 2012. This watch exemplifies clean, modern design, making it a timeless classic. The Braun Men's Chronograph Watch is available from Stardust with Free Shipping and a Low Price Guarantee. 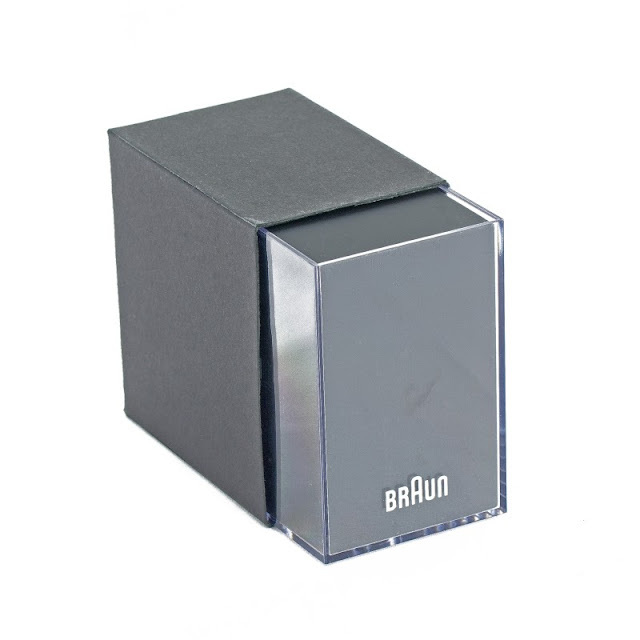 This Braun watch is supplied in an official Braun box, along with any instruction manuals and official 2 year Braun guarantee.